Watch out Jersey, We’ll be back! THE Bermuda Island Games may nor have been vintage for the gold-medal machine that has been GIAAC over the past decade, but the statistical evidence is that the club are as strong as ever and the future is very bright. ‘It’s been a transitional year,’ argues GIAAC president Alun Williams, who is encouraged by the weight of performances in the national Power of 10 rankings. Now the focus is on re establishing itself as the number one athletics island at the 2015 Island Games in Jersey. 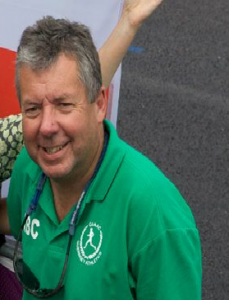 ‘A benchmark that we always use is the number of athletes achieving a top 100 ranking in mainstream outdoor events and it was reassuring to see that we were broadly similar to the previous Island Games year 2011,’ said Williams. ‘In 2013, 24 athletes were placed in the top 100 compared to 22 in 2011,’ he added. ‘The club is focusing much of its resources in ensuring that athletics can prosper amongst junior athletes and success in 2013 suggests that the club is beginning to reap the dividends for that investment. ‘Nearly 50 under-13 and under-15 athletes were listed in the rankings. These are performances that are considered equivalent to county standard. Paul Ingrouille, one of the club’s main junior coaches is reassured by the rankings. ‘Particularly pleasing is that we have 11 entries in the under-17 section, suggesting both depth and quality,’ he said. ‘It was also promising to have four of this age group –Sam Wallbridge, Danny Ray, Katie Rowe and Zoe Fitch – achieving invites to compete in English Schools Championships where Sam’s gold medal in the 400m hurdles of course was the icing on cake and reward for the commitment and hard work he has put in to training. Danny Ray in both 1500m and 5000m, Katie Rowe in the 1500m and Cameron Chalmers in the 400m. The other notable performance was Ed Mason breaking the under-15 records in the 1500m and 3000m. Alongside these individual achievements the GIAAC has also been reviewing the targets that the club set itself after 2011 Island Games. These ranged from increase in numbers of athletes, improved training opportunities, building on the profile of current elite athletes and developing the quality of the club’s event programme. Williams said that the club has met or exceeded 20 of the 22 targets. In particular, a target was to increase general membership from 364 to 400 and the GIAAC currently has 476 members. It also aimed to increase the number of juniors by 10% to 100 members. The club now has 126 juniors. And also the target of increasing the number of quality coaches by 25% (from 20 to 25) has also ben met with something to spare. GIAAC currently has 35 qualified and active coaches. Meanwhile, the club have launched an in-house consultation process on the future of athletics in Guernsey. ‘We knew that 2013 would be a transitional year for us as our focus has been on youth and development. Bermuda 2013 was always going to be a challenge as so many of our top athletes would not be competing. Injury and retirement also impacted on the performances of our senior athletes,’ said Williams. ‘Understandably the focus of achievement for the sole athletics club in Guernsey is on our top performers. That is only to be expected but we are fervent believers of the importance of giving all our athletes the opportunity to fulfil their potential. That’s a healthy position with regards to the biennial Island Games. GIAAC were without their big guns in Bermuda but there is every hope the likes of Lee Merrien, Dale Garland, Tom Druce and Kylie Robilliard will be back for Jersey in 18 months’ time and with the fast-emerging talent backing them there will be a rush of medals just as there were in every games from 2003 through to 2011.